I had an L4, L5, S1 spinal fusion 2 years ago. Due to multiple reasons: inactivity and medications I have gained weight that I would like to lose. What exercises are safe for me to begin? Hi Beverly and thanks for your question. First of all, find an aerobic exercise you like to do to lose weight. I would recommend swimming, riding a recumbent bike, walking, etc. 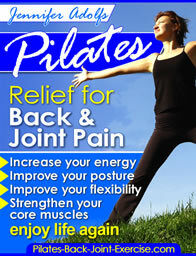 Many of the Pilates exercises are safe for you to do, however they are not aerobic in nature. Pilates will help you to build muscle tone, which will help to decrease your overall body fat percentage. Let's go over some Pilates exercises that would not be beneficial for you; specifically rolling like a ball as this would put undo stress on your spine, spine roll ups would be difficult due to the fusion, spine twist, and the prone (belly down) exercises extend and twist the spine too much. You may be able to do the prone exercises with a pillow under your pelvis to support the lower back. Pilates exercises that would work well for you with a spinal fusion are the; hundreds, leg circles, single leg stretch, spine stretch forward, cat stretch, side kicks, and bridging. Note: These exercises may all be modified so you do them with a limited range of motion and without pain until you are stronger. Tips on Exercising after Back Surgery. Pilates Bridge for flatter abs and strong glutes. Pilates Cat Stretch to help ease low back pain and tightness. The Pilates Ebook has descriptions of all the exercises with 3 levels of progressions for each one so you can modify as you need to. Yes, and that cute cat on the Cat Stretch page is my very own Pumpkin!